The UK is choosing its new 56th parliament in the 2015 General Election. There are 650 constituencies across the country. 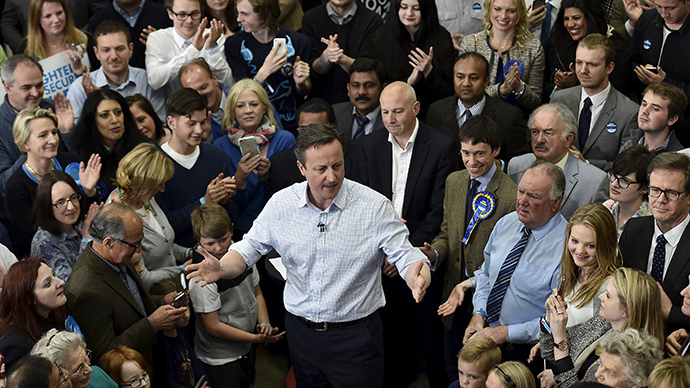 A shock exit poll suggests that the Conservatives are heading for the largest number of seats. PM Cameron said that he would keep George Osborne as Chancellor of the Exchequer, the top finance minister, in his new government. Osborne served as Cameron's chancellor throughout his first five-year term, overseeing the recovery of the country's economy after the financial crisis. Philip Hammond will be reappointed Foreign Secretary, David Cameron announced after winning the country's general election. Defense Secretary Michael Fallon will keep his position in the new UK cabinet, re-elected PM David Cameron announced. The UK’s re-elected prime minister, David Cameron, has reappointed Theresa May as Home Secretary. May has held the position since 2010, in Cameron’s previous cabinet. In order to give the election results a more homely touch, Twitter user Tom Katsumi was “live-stitching” the UK vote with needlepoint. European Council President Donald Tusk expressed hope that Britain will remain an EU member under re-elected UK Prime Minister David Cameron. Britain played a key role in ensuring that Europe had a “common sense agenda,” emphasizing the need for a competitive economy, an effective single market and free trade, Tusk said in a statement. "I count on the new British government making the case for the UK's continued membership of the European Union. In that I stand ready to help," he stressed. "I am deeply convinced that there is no better life outside the European Union, for any country. A better EU is in the interest not only of Britain, but of every member state," Tusk added. According to George Eaton, Political Editor of the New Statesman, Cameron's victory is historic. Cameron is the first PM since 1900 to have been in power for more than 18 months and to have increased his party's vote share. Labour MP Tom Watson, who was a Parliamentary Secretary for the Cabinet Office from 2008 to 2009, has said he will consider standing for deputy leader of the Labour Party after current incumbent Harriet Harman stands down. Former Labour leader Ed Miliband, who resigned this morning after his party suffered a humiliating defeat in the general election, has tweeted that it has been an "utmost privilege" to serve as party chief.